financial aid and financing options. As part of that commitment, all students who self-identify as U.S. veterans are assigned a dedicated financial aid adviser/point of contact, Gregory Williams, who has appropriate credentialing and training in understanding the particular needs of veterans and service members. Students attending the Feirstein Graduate School of Cinema are assigned to Moshe Axelrod, who is also the secondary veteran point of contact. For a detailed timeline of the financial aid process, review our Financial Aid Application Timeline Presentation (pdf). The financial aid application process begins with filing the Free Application for Federal Student Aid (FAFSA) and New York State Tuition Assistance Program (TAP) application and veteran's supplement. You must file once a year for each academic year if you wish to be considered for aid. The new FAFSA and TAP application become available for the upcoming academic year on October 1 of every year. This allows you to file up to 10 months before the start of the following academic year and have all financial aid processes well in order and completed before the first bill due dates. 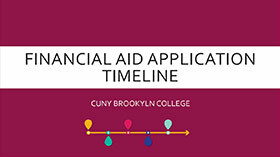 Brooklyn College has a priority financial aid application deadline of May 1. While you can still file for financial aid after this deadline, certain federal programs that are limited may not be available if you file after that date. We recommend that students have all financial aid process completed before their first tuition bill due date, which is usually in July for the fall semester and in January for the spring semester. We encourage and welcome all students to carefully review this information and meet with the dedicated veterans point of contact (POC) to discuss any and all inquires related to their cost of attendance. There are multiple avenues for veterans to finance their education at Brooklyn College. Student veterans are potentially eligible for federal student aid and veteran-specific New York State financial aid programs in addition to any Department of Veterans Affairs (DVA) educational benefits. Similarly, there are special financial aid programs available for the spouse or dependent(s) of a veteran. Federal student financial aid programs are administered through the U.S. Department of Education. These programs are funded by Congress under Title IV of the Higher Education Act of 1965 as amended. These programs are available to all applicants who meet the basic eligibility and income, household size, and course enrollment criteria including service members. Aid from these programs can be used in addition to DVA educational benefits (such as the GI Bill). The first step in being considered for federal student aid is to file a FAFSA. The U.S. Department of Education has a Aid for Military Families webpage, which is an additional resource for service members and their families to learn more about specific financial aid options. New York State financial aid programs are administered by the New York State Higher Education Services Corporation (HESC), a New York State government entity. HESC has a dedicated Military Corner webpage that provides reources for veterans to learn about financial aid opportunities in New York State. New York State has veteran-specific financial aid awards. Some of these awards are available to service members or to the dependents/spouse of a service member. We strongly encourage every veteran or dependent/spouse of a veteran to review the information on the HESC Military Corner webpage. NOTE: VTA cannot be used with other financial aid programs that are earmarked exclusively for tuition costs. Therefore, VTA cannot be used by a student veteran who is receiving 100 percent of the Post-9/11 GI Bill, which would cover their full tuition at Brooklyn College. However, a student veteran receiving a partial Post-9/11 GI bill payment may be able to receive a partial VTA award. VTA and the Montgomery GI Bill however, can be used simultaneously. VTA may be used for undergraduate or graduate study. VTA requires that all of the courses you take be applicable toward your program of study. The U.S. Department of Veterans Affairs offers educational benefits to U.S. veterans such as the Post-9/11 GI Bill, the Montgomery GI-Bill, and the Reserve Educational Assistance Program (REAP) among other opportunities. More information about educational benefits offered through the DVA are available on the DVA's Education and Training webpage. Other DVA resources include the GI Bill Comparison Tool. Students with questions about the DVA educational benefits certification process should visit the Brooklyn College Veteran and Military Programs Office for assistance. Scholarships—Brooklyn College offers institutional scholarships. Brooklyn College Scholarship opportunities are administered by the Scholarships Office. Alternative Private Educational Loans—These are loans that are offered through third-party private educational lenders. The Brooklyn College Office of Financial Aid, pursuant to the CUNY Model Code of Conduct, cannot recommend a particular lender. The Office of Financial Aid recommends that other financing options be explored before considering an alternative educational loan. CUNY, through the Bursar's Office, offers a tuition payment plan option administered through the educational financial services company NelNet. There is a fee per semester for enrollment in the plan. More information about this option is available on the Bursar's webpage. The Office of Financial Aid has two full-time staff members with appropriate training and credentialing who are designated points of contact (POC) for all veterans attending Brooklyn College. Both POCs received Military Cultural Competency Training through the Jewish Board of Family Services (JBFCS) Home Again: Veterans and Families Initiative in April 2013. The training has the equivalent of six credits of continuing education units. The primary POC is Gregory Williams, assistant director for special programs, 308 West Quad Building. The secondary POC is Moshe Axelrod, assistant director for financial aid advisement, 217 West Quad Building.